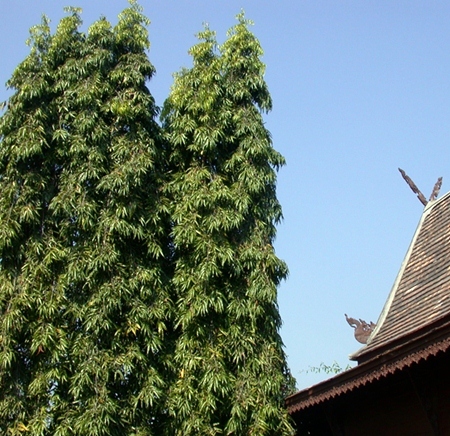 This is the mast-tree or Asoka tree, Polyalthia longifolia var. pendula (Annonaceae). Frequently we have met with garden travellers who have spent months in India and Southeast Asia, trying to figure out what a particular evergreen tree is. The tree is native to Sri Lanka, but you commonly see it on the grounds of Hotels and Resorts all over the tropics. Planted as solitary trees, or too wide apart, they seem straggly. Here at Dokmai Garden we planted young saplings densely (50 cm apart) and they grew quickly to create a tall evergreen palisade protecting us against the southwestern monsoon. The concept of garden rooms appeals very much to me, and the mast tree is indeed an element to consider. In the picture above, the distance between the roof and the rightmost tree should be larger, due to the movements during storms. The tree may suffer from attacks by borers, leaving a gap in the palisade. To cure this I suggest you do not fertilize the palisade ever, except when you lose one top shoot due to borers and want that particular tree to catch up with its neighbours. The small fruits are attractive to nectar bats and the palisade might become a sanctuary for bats and nectar bats, which is appreciated and even wanted by some gardeners. People can eat the orange-red fruits too, but they are not particularly tasty. The tree was originally described as Uvaria longifolia by Pierre Sonnerat in 1768 (Voyage aux Indes Orientales). He saw it along the coast of Coromandel, i.e. the southeastern coast of India and Sri Lanka. The tree was later (1864) transferred to the genus Polyalthia by George Henry Kendrick Thwaites who published ‘Enumeratio Plantarum Zeylaniae’ (a flora of Ceylon, Sri Lanka).